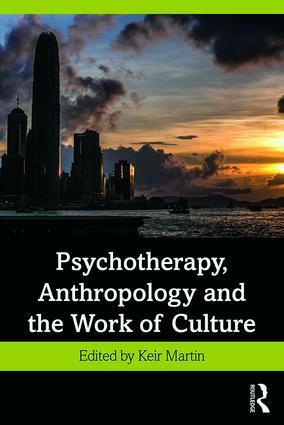 Anthropology and psychotherapy have a long and important historical relationship, and in this fascinating collection practitioners with experience in both fields explore how the concept of ‘culture’ is deployed to guide and frame contemporary therapeutic theory, training and practice. This task is particularly important as the global spread of psychotherapy, as both an outgrowth of and a potential point of critique to globalised hyper-capitalism, requires us to think differently about how to conceptualise cultural difference in psychotherapy. Psychotherapy, Anthropology and the Work of Culture provides a valuable resource for psychotherapeutic professionals working in a world in which cultural difference appears in fluid and transient moments. It will also provide essential reading for students and researchers working across the fields of psychotherapy and anthropology. "With its rich, thoughtful and accessible reflections on the intersections between the anthropological ethnographic method and psychoanalysis and psychotherapeutic practice, this volume unsettles the individual and society/culture binary to expand our appreciation of the nature of social relations. Keir Martin brings together contributors who not only have a ‘feel’ for both disciplines but also the capacity to ask the challenging questions that push boundaries. This book is fascinating and timely." --Louise Gyler, Psychoanalyst and Author, The Gendered Unconscious: Can Gender Discourses Subvert Psychoanalysis? Keir Martin is Associate Professor of Social Anthropology at the University of Oslo and was previously Lecturer in Social Anthropology at the University of Manchester. He has conducted ethnographic fieldwork in East New Britain Province, Papua New Guinea and is a member of the British Association for Counselling and Psychotherapy.